Days after the head of the premier civilian spy agency informed the Senate Standing Committee on Interior that Daesh, the self-styled Islamic State (IS) group, was emerging as a threat in the country, Interior Minister Chaudhry Nisar Ali Khan on Saturday said that Daesh has no presence in Pakistan although the moniker may be being used by other terror groups in the country. “Daesh does not exist in Pakistan. Other terrorist groups, which are involved in activities against the State are using Daesh’s name and are causing death and destruction in the country,” the interior minister said. 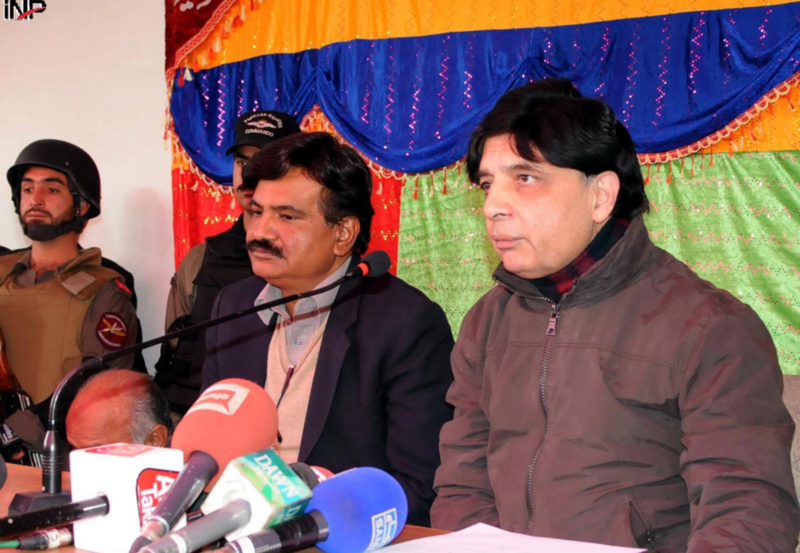 Speaking to media after inaugurating Rescue 1122 services in Kallar Syedan, Rawalpindi, Nisar said that Daesh does not maintain the same level of presence in Pakistan as it does in other North African and Middle Eastern countries. The Interior Ministry has been denying the presence of Daesh in Pakistan, saying that it is a Middle Eastern organisation primarily active in Arab countries. However, DG IB Aftab Sultan said the security agencies had busted a huge Daesh network after several members reached Punjab following Karachi’s Safoora Goth carnage in May. Sultan had said that several militant groups had a soft corner for Daesh. He specifically named Lashkar-e-Jhangvi and Sipah-e-Sahaba Pakistan. Sultan elaborated that terrorists were regrouping and stressed the need for a border control mechanism, particularly with Afghanistan, enhanced regional cooperation, implementation of the National Action Plan and the de-radicalisation policy with a focus on counter-narrative. Inter-Services Public Relations (ISPR) Director General Lt Gen Asim Bajwa had also stated in November 2015 that Pakistan has a zero tolerance for Daesh and the terrorist group has no acceptance in the country. He said that the Pakistani society had totally rejected Daesh. He had also stated that action would be taken against any advance of Daesh in Pakistan. The interior minister also said in November that there is no presence of Daesh in Pakistan. IS has staked a claim on this region — which it refers to by its historical name of ‘Khorasan’ — as part of its expansionist agenda after its territorial gains in Syria and Iraq, where it is putting its ultra-radical ideology into practice and offering a template for terrorist groups around the world. As many as 43 terror groups from countries ranging from Libya, Sudan, Egypt and India to Algeria, Tunisia, Philippines and Indonesia have pledged allegiance to the Abu Bakr Al-Baghdadi-led group. Notorious terror group Boko Haram in Nigeria pledged allegiance to Daesh in March 2015. At least four militant groups in Pakistan have also pledged allegiance to Daesh. These include Jundullah, Tehreek-e-Khilafat, Islamic Movement of Uzbekistan which is said to have presence in both Uzbekistan and Pakistan and Leaders of the Mujahid in Khorasan which is a group of ten former TTP commanders. Lashkar-e-Jhangvi, one of the main perpetrators of sectarian carnage in the country, also has ties with the ‘IS-inspired’ militants, police officials disclosed earlier. Daesh made gains during the civil war in Syria but shot to prominence after its blitzkrieg campaign in 2014 which captured large territories in Iraq. The Iraqi army at the time abandoned their positions leaving their weapons and equipment on the battlefield without putting up a fight. Daesh proceeded to massacre large populations in areas under their control. In recent months, Daesh’s gains have plateaued after the Iraqi army regrouped and the international campaign against Daesh gained momentum although it still controls vast landlocked territories in Iraq and Syria. On Saturday, it was reported that Saudi Arabia has sent troops and fighter jets to military base in Turkey ahead of intervention against Isis in Syria. Saudi Arabia has announced the bid to oust Bashar-al-Assad also, who is himself battling Daesh with Russia’s support. Daesh, at one point, appeared to be supplanting al-Qaeda in the region with many former al-Qaeda affiliates announcing support for the group. In January 2015, Daesh announced its organisational structure for ‘Khorasan’ led by a former leader of the banned Tehreek-e-Taliban Pakistan (TTP) from Orakzai, Hafez Saeed Khan. A former Afghan Taliban leader, Mullah Abdul Rauf Khadim, was named his deputy. Lack of co-ordination between the Czar, DG IB, ISPR and Sind Government. Whom to believe ?